Nathan Pryor was getting frustrated by news of Trump administration policies that he disagrees with. So he did what any a self-described designer, programmer and "tinkerer" would do: He hacked into an Amazon gizmo designed to instantly order consumer goods for the home and made it donate $5 to the American Civil Liberties Union with every press, instead. OK, so maybe that's not something anyone would do. Pryor credits his friend Katherine with the idea, but his follow-through on the execution has made donating to the ACLU as easy as, well, pressing a button. "I would love to see these become a real product that organizations across the political spectrum could offer," Pryor, who is based in Vancouver, Washington, told NBC News on Wednesday. "The more that can be done to lessen the friction of giving, the more people will donate, and I think the immediacy of it would increase their sense of involvement." Pryor, who started work on the coding script on Jan. 30, said the project was actively donating to the ACLU by 11 o'clock that night. 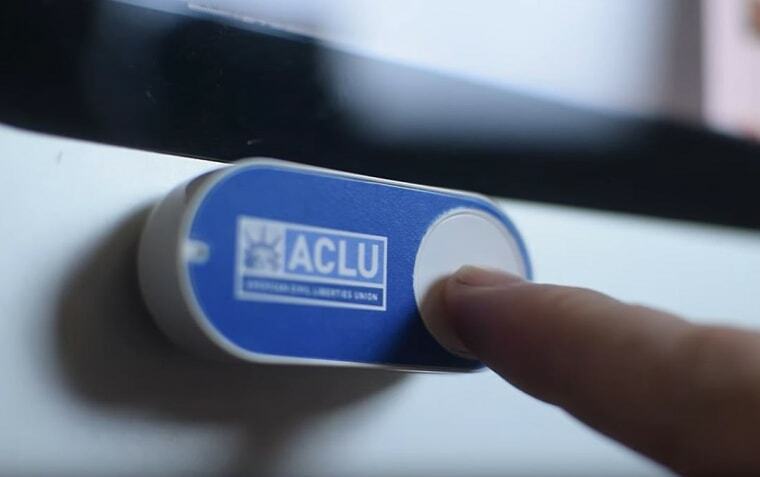 He printed out an ACLU logo and glued it onto the button, and it was ready to go. Amazon introduced the Dash Button in 2015 to allow frazzled consumers to reorder essential home supplies by literally pressing a button that sticks to a surface at home. For example, the "Cascade" Dash Button might be slapped onto a dishwasher, and the "Charmin" button might go next to a toilet paper roll. The Dash Button quickly became a favorite hobby project for hackers and "maker" types, who invented hacks that allowed users to control lights, build a silent doorbell and track work hours all with a single push. Amazon responded by releasing a developer kit and a customizeable "Internet of Things" button called the AWS IoT. Amazon didn't respond immediately to a request for comment. Pryor's version looks to be one of the first Dash Buttons that donates to a charitable cause, and he told NBC News that he's already pressed it enough times to have donated about $30 over the past week. When asked to pinpoint which moments in Trump administration policy led to each button smash, he said it was hard to choose from "a long list." "The biggest issue for me so far has been the immigration orders," Pryor said. "To me, that one crosses the line into unconstitutional territory, rather than being just a disagreement about policy." He's got a lot of ideas about how to implement a nonprofit donation button on a large scale, too. Pryor told NBC News that use of the buttons among supporters could provide "great feedback" to an organization. "If 10,000 people pushed to donate within 10 minutes of a policy announcement, while another announcement brought only a trickle through the day, the organization would have a new perspective on what mattered to its donors," Pryor said. Others seem to share his desire for a super-simple instantaneous way to donate to the ACLU. After learning about Pryor's hack through a Medium post and a slew of news reports, coder Michael Arthur Aguirre posted on Facebook that he was "programming a couple of these right now," telling friends to "hit me up if you want one." The ACLU didn't immediately respond to a request for comment, but the ACLU of Washington retweetedan article about the button, calling the project "so cool."